Set in Oregon in the early years of the twentieth century, H. L. Davis’s Honey in the Horn chronicles the struggles faced by homesteaders as they attempted to settle down and eke out subsistence from a still-wild land. With sly humor and keenly observed detail, Davis pays homage to the indomitable character of Oregon’s restless people and dramatic landscapes without romanticizing or burnishing the myths. 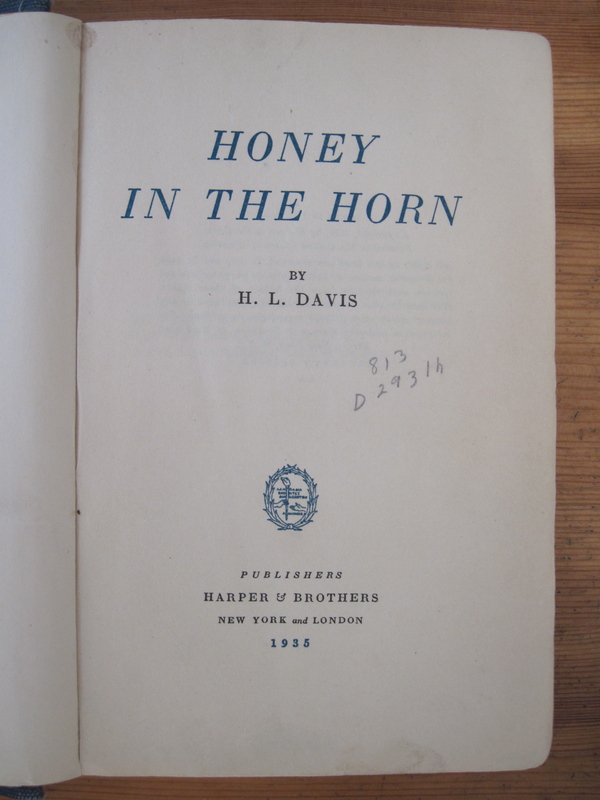 Originally published in 1935, Honey in the Horn reveals as much about the prevailing attitudes and beliefs of H. L. Davis’ lifetime as it does about the earlier era in which it is set. It transcends the limitations of its time through the sheer power and beauty of Davis’ prose. Full of humor and humanity, Davis’s first novel displays a vast knowledge of Pacific Northwest history, lore, and landscape. In a note at the start of the novel, H. L. Davis writes, “I had originally hoped to include in the book a representative of every calling that existed in the State of Oregon during the homesteading period–1906-1908. I had to give up that idea owing to lack of space, lack of time, and a consideration for readers. Within the limits set me, I have done my best.” This note, a sort of thesis to the novel, works well to prepare the reader. You should not expect to find a story driven by the plot, but by the characters. So much so that they plot often becomes secondary to the characters, going out of its way to create situations for the protagonist to meet new and different types of people around Oregon. It is a sort of role call of the Oregonian people at the start of the Twentieth Century, with a vaguely disguised plot attached. With the new wording for the prize criteria calling, not for “the best novel” but “a distinguished novel,” the same jury from the year before deliberated, and recommended Honey in the Horn by H. L. Davis for the prize, stating, “There is lively and varied action and exceedingly graphic description of a little known section of the country,” and comparing the “style and humor” of the novel to Mark Twain’s writing. The jury listed as lesser suggestions, This Body the Earth by Paul Green, Time Out of Mind by Rachel Field, Silas Crocket by Ellen Chase, Ollie Miss by George Wylie Henderson, Deep Dark River by Robert Ryles, and Blessed is the Man by Louis Zara. 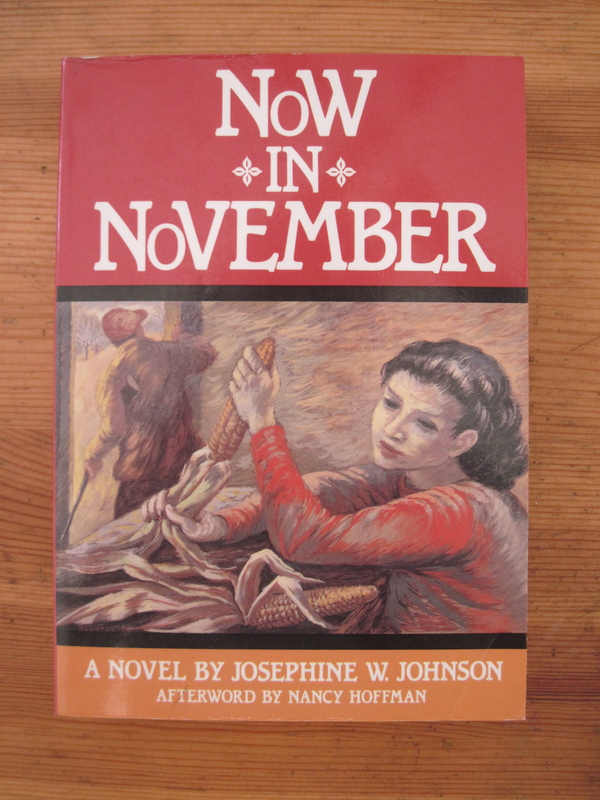 Originally published in 1934, Josephine Johnson’s first novel, about a middle-class family driven into poverty by the Great Depression, won the Pulitzer Prize and drew clamorous praise. Certainly, more than 50 years later, its characterizations ring remarkably true: a family of three daughters, struggling to exist as dirt-poor farmers, the father unable to respond to the fiercely devoted eldest girl who longs to be his “son.” The brief and intense narrative movingly evokes the torment of people isolated, and driven by strong–yet often unexpressed–feelings of love and hatred, and paints and indelible portrait of the Depression and Dust Bowl years. I read Now in November around the same time as I saw Christopher Nolen’s film, Interstellar. I won’t comment on the rest of the movie, but the opening scenes are filled with actual interviews, conducted by Ken Burns, of Dust Bowl survivors. I did not know they were real interviews when I went into the movie, but recognized immediately that it was not scripted, that those people were speaking from a raw and intimate knowledge of something apocalyptic. The land itself rose up against them and was terrible in its destruction. Josephine Johnson captures those feelings and emotions in the pages of Now in November. Johnson also captures the brokenness of humans, the struggles of despair and depression and mania, and the melancholy resignation that comes on as disaster leaves no choice but to be accepted, even as you’re attempting to fight against it. The 1935 Novel Jury, apparently in some disagreement, and unimpressed with the year’s offerings in fiction, issued a harsh report at the end of their deliberations, stating, “It seems impossible for your jury on the Pulitzer prize for the best American novel to agree this year on anything but that there is, in their opinion, no outstanding novel.” The jury went on to list eight possible selections: Slim by W. W. Haines, The Folks by Ruth Suckow, Now in November by Josephine Johnson, Goodbye to the Past by W. R. Burnett, The Foundry by Albert Halper, Land of Plenty, by Robert Cantwell, The American by Louis Dodge, and So Red the Rose by Stark Young.